To get a better sense of power dynamics in global politics, this book presents an innovative theoretical framework, combining a critical engagement with, and further development of, Michel Foucault’s governmentality on the one hand, and the theory of world society of the Stanford School of Sociology on the other. Making an original contribution to academic debates about power and global political order, this book develops a comprehensive theoretical perspective on power relations and political dynamics. The book starts from the presupposition that any theoretical engagement of that kind requires nuanced empirical study as well. It therefore analyzes the dynamics of world-societal order in the concrete empirical example of Palestine, and raises the question of how its political and societal order comes into existence. The author argues that governmentality represents a fundamental pattern of political order in world society that also profoundly affects power dynamics in Palestine. This insight has two important implications: First, power relations do not follow dichotomous distinctions such as international/domestic or global/local, but manifest themselves within world society. Second, therefore, order that comes into existence in Palestine needs to be understood as world-societal order. 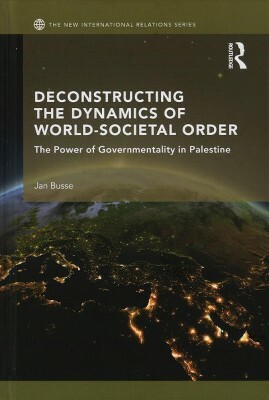 Offering a comprehensive understanding of power relations and patterns of political order(ing) embedded in world society, the book provides a deeper understanding of the complex dynamics that contribute to the political and societal order of Palestine. This book will be of interest to scholars and students of Middle East Studies, Palestine Studies, International Relations, International Political Sociology, International Relations Theory, Governmentality Studies, and Political Theory.